LILONGWE, Oct 12 2010 (IPS) - A public spat has developed between the Malawian government and organisations in the small south-eastern African country over foreign exchange being “wasted” on foreign trips undertaken by President Bingu wa Mutharika. The consequence has been repeated fuel shortages, organisations say. Malawian small businesses are in dire straits due to a shortage of fuel that hit the country at the beginning of September. Some enterprises are unable to move goods to and from markets while others that depend on diesel or petrol to run machinery have had to suspend operations. Fuel has become so precious that it is now being rationed. People park their vehicles at service stations overnight, forming long queues as they wait for petrol tankers to arrive. Jennifer Chienda, who trades potatoes that she grows on her smallholding in Dedza district, central Malawi, has already incurred losses of some 1750 dollars within three weeks. She usually makes an average of 500 dollars a week by delivering potatoes to a number of restaurants in the country’s capital, Lilongwe. But since the fuel crisis hit the country in early September, she has been unable to transport her merchandise. “Heaps of potatoes are just lying in front of my door. I can’t move them because there is no fuel in the pumps. I am afraid some potatoes have already rotted,” Chienda told IPS. She owns a small truck that she uses to transport her goods. “I spend a lot of time going around service stations looking for diesel but have so far failed getting enough for the truck to travel to Lilongwe,” an unhappy Chienda said. Last year Malawi also suffered from a fuel crisis which lasted for close on two months and, according to the Economists Association of Malawi (ECAMA), led to businesses suffering losses of up to 74 million dollars. ECAMA warned that that the unavailability of fuel would again have long- lasting negative economic consequences. Jonah Kaduli is facing losses for the second time in two years. He has been running a maize mill for the past 12 years. He told IPS that the shortage of fuel, especially diesel, has interrupted operations at the mill for the past four weeks. From making 300 dollars a week, Kaduli’s income has dropped to zero since the fuel shortages started. “I am not the only one losing out. Some of my clients mill maize to make flour that they sell to households. They cannot do this because I cannot get diesel to run the mill,” explained Kaduli. Products derived from maize are staple foods in Malawi. The flour is mostly processed at mills run by local merchants like Kaduli. Malawian information minister Simon Vuwa Kaunda has blamed the lack of fuel on trucks taking more time to cross the Tete Bridge at the Zambezi River in Mozambique due to road works. Vuwa Kaunda told the local media that tankers carrying the commodity from the Port of Beira were being slowed down at the bridge on their way into Malawi. “The shortage of fuel is due to logistics,” Vuwa Kaunda alleged. But Mozambique’s high commissioner to Malawi, Pedro Davne, dismissed the minister’s assertions at a media briefing, insisting that the road works were not affecting transport. 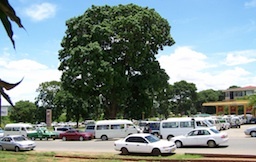 The Road Transport Operators Association (RTOA), representing businesspeople in Malawi who own goods-carrying vehicles, also questioned Vuwa Kaunda’s statement, given that the renovation of the Tete Bridge has been going on for some 18 months without affecting the fuel supply into Malawi. Apart from the fuel that is transported via Beira, Malawi also gets its petroleum via Nacala in Mozambique and Dar es Salaam in Tanzania. Meanwhile, Petroleum Importers Ltd (PIL), a private company owned by oil companies in Malawi that brings fuel into the country, has pinned the unavailability of fuel on delays in payment to the oil suppliers. PIL said Malawi has a shortage of foreign exchange that makes it impossible to procure oil. The Council for Non-Governmental Organisations in Malawi (Congoma), an umbrella body representing non-governmental organisations, has blamed the shortage of foreign exchange on President Bingu wa Mutharika who they accuse of undertaking too many international trips that waste foreign exchange. Since April Mutharika has travelled to Canada, Zambia, Namibia, Swaziland, Germany, China, U.S., Cuba and Iran. The president is scheduled to travel to India and Britain before the end of the year.